It’s a bird, it’s a plane…?! No, it’s definitely a Taurus. I am in a relationship with the most Taurus-y Taurus out there. As a Pisces/Aquarius cusp, we are on either sides of the spectrum. My emotional waters spill over his stability; my air dances with his Earth as we learn to understand each other. The Taurus is the second sign in the zodiac. Latin for bull, Taurus is represented by the Cretan Bull in Greek mythology. The symbol of the bull is determined, strong willed and persistent in it’s nature. Ruled by Venus, the planet of beauty, pleasure and emotional attachments; Taurus becomes a balance of the male and female aspects within us. As I look deeper into this sign, I’m seeing different sources explain how most Taurean’s are known for being so stable and dependable because they dislike change. From my experience, I have seen exactly the opposite. Those seem to be the two extreme aspects of the bull; the stubborn, slow and resistant side, and then the free, quick and adaptable side. The energy of the bull is known to be intensely determined, they are great at finishing what they start and acting as that motivational push in your life. That push and pull is something many Taurean’s are learning to balance. When to be the ebb, and when to be the flow of life. As an Earth element, Taurean’s work well with their hands, they are practical and all about bringing down those floating ideas to fruition. They are the pusher, they want to see growth, transformation and change. Depending on who you are and how you grew up, as a Taurus you either need to have constant growth in your life, or it’s something you dread. The stable symbolism of the bull suggests many Taurean’s dislike change in their life; is this true for you? One of the biggest challenges I have when working with a Taurus is finding a balance between the ethereal and the physical. I’m all mental, and my partner is all physical, doing and creating. I’m the air that swirls around the bull as it charges. When in a relationship with a Taurus, it’s all about knowing when to switch roles; when to be soft and when to be the stability. When he takes the role of the running bull, I shift to become the support structure underneath him and vice versa. Finding that beautiful balance within the bull comes from combining soft mental energies with practical, physical energies. 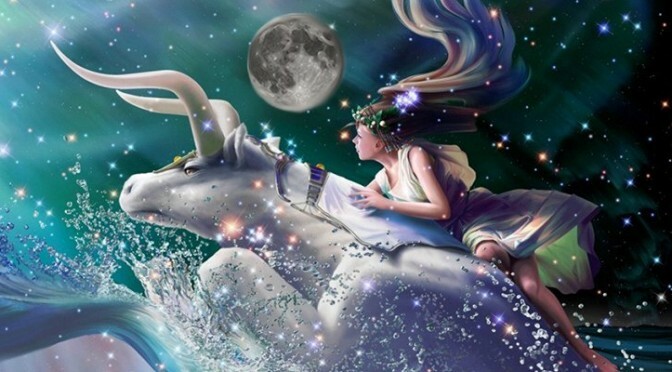 Combining the gentle energies of Venus with the boldness of the bull creates a beautiful harmony of two opposite forces. Many Taurean’s are committed, they are in it to win it and if you can’t take their heat – that bull will definitely kick you out the kitchen. When speaking of any sign of the zodiac, you really need to factor in that person’s rising sign and moon to get a full understanding of who you’re dealing with, though, right? In fact, one’s entire chart offers clues into the whole personality. Look at President Trump, a Gemini with a Leo rising. There’s a lot of “lion” in him! Courage. Leadership qualities.